Large deciduous tree ideal for urban landscapes. Green leaves, golden fall color, and red/brown bark that peels to reveal salmon inner bark. Resistant to Bronze Birch Borer. Prefers acid soil. PRUNING, Prune to remove undesirable or dam- aged branches. Remove lower limbs as tree matures. 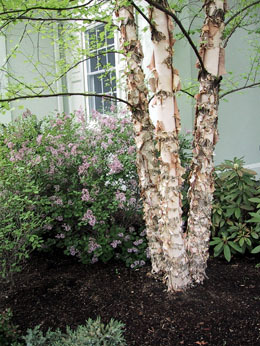 Thin out inner branches, especially on clump forms.